The Sri Lankan Ambassador in The Netherlands, Buddhi Athauda says that so far they have not found any Sri Lankan passport holders in Malaysian Airlines Flight MH17 which crashed in east Ukraine. The Malaysian flight was en route from Amsterdam to Kuala Lumpur and was flying over the region that has recently seen deadly fighting between Ukraine and Russian forces when it crashed on Thursday. Ukrainian officials called the crash an act of terrorism, saying the plane may have been shot down. In response, many airlines are rerouting their flights to avoid Ukrainian airspace. No Sri Lankan nationals were among the 298 people killed when the Malaysia Airlines plane was downed, but the identities of many of the passengers remain unclear. Airline officials were still working late Thursday to determine the full list of who was aboard the Boeing 777, which crashed earlier in the day while en route from Amsterdam to Kuala Lumpur. Malaysia Airlines said the dead include at least 154 Dutch citizens; 45 Malaysians, among them two infants; the crew of 15; 27 Australians; 12 Indonesians, including an infant; nine Britons; four Germans; four Belgians; three Filipinos; and the Canadian, with other identities still being confirmed. Malaysia Airlines said it was in the process of notifying the next of kin. 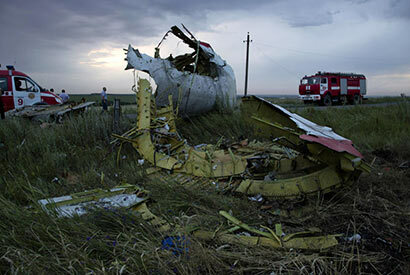 The airline said the cause of the crash was unclear, though Ukrainian officials say it had apparently been shot down. The Malaysia Airlines plane appeared to break apart at altitude, with local reports and images showing its debris scattered across fields. In a statement, Malaysian Prime Minister Najib Razak said he’d spoken with counterparts in the Netherlands, Ukraine and United States. He called for a global response to the crash, though said it was too soon to say what caused it. Malaysian Airline is at fault for flying over the war zone, eastern Ukraine.